Digital signage discounts on, NEW android plug and play USB Digital Signage screens, Freestanding units, plus great large screen budget options. And for those sunny days install a high bright screen at our great discount Prices. Call us today for more info. Get yours for Christmas PROMOs NOW… Autumn Offers End Soon. 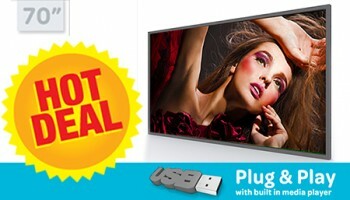 70″ USB plus and Play screen ONLY £2,399.